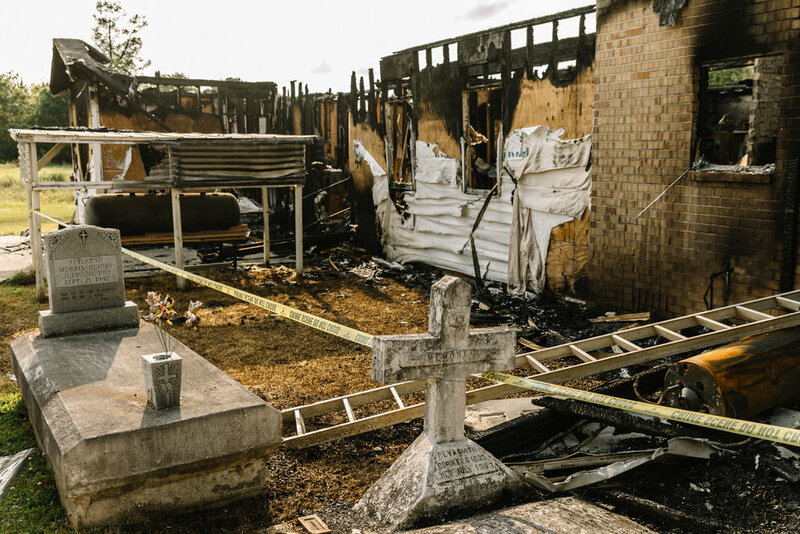 Greater Union Baptist Church in Opelousas, La., was one of three historically black churches that were destroyed in St. Landry Parish in recent weeks. "A Charred Gas Can, a Receipt and an Arrest in Fires of 3 Black Churches," via the New York Times. "Authorities announced the arrest of a 21-year-old white man who is the son of a local sheriff’s deputy and an aficionado of a subgenre of heavy metal, called black metal, whose most extreme practitioners in Norway have engaged in church burning, vandalism and killing." Earlier this week, I recorded an episode of the Riverside Church's podcast "Be Still and Go" Lenten series. I avoided talking about politics--which is rare for me--and discussed some of what I've learned in my past three-plus years of individual and group psychotherapy. The episode is titled "Facing Pain" and you can listen to it here. My reflection is tied to this passage from Matthew and here's a brief excerpt in case you don't want to listen to the entire episode: "I’m learning in therapy it’s not always Easter. My experience over the past few years of facing my own pain has allowed me to more fully enter this Lenten season and see the pain of Jesus and his followers. As Christians, we like to call ourselves Easter people and we believe in resurrection -- the idea that God’s love is bigger than empire, oppression, evil, and even death. But I don’t think we can possibly believe in resurrection without fully acknowledging the depth of sadness and pain that led Jesus to the cross." I do believe this lesson has political implications though. I've found progressives sometimes are too tied to the idea of progress. It's even part of our name! But we certainly aren't on a linear path from oppression and injustice to resurrection and peace. As much as I've loved President Obama's second inaugural speech when he said: "We, the people, declare today that the most evident of truths – that all of us are created equal – is the star that guides us still, just as it guided our forebears through Seneca Falls, and Selma and Stonewall," we know that the moral arc of the universe is just shooting straight upwards. One of the clearest cases of where we see the moral arc of the universe going in circles is attacks on houses of worship. The white son of a local sheriff burned black churches down, not long after the recent shooting at a synagogue in Pittsburgh. When I was growing up, these kinds of incidents were talking about as a chapter in history and that we've turned the page. Unfortunately, we are witnessing the globalization of hate where the Louisiana suspect was inspired by Norwegian church burnings. And the New Zealand mosque attack was carried out by someone who was inspired by attacks all around the world. During Lent, we reflect on our own mortality but also the systemic sin in the world. Then at Easter, we rejoice in the resurrection and the hope of a new, just world. It's not a linear path forward of progress, but a yearly return to focus our hearts and minds on repentance and then joy. I encourage us to face the pain of the world in these final days of Lent -- not looking ahead to Easter or minimizing the injustices in our country and around the world. Sit here with me, and no matter what we accomplish in the year ahead, we'll be back sitting in this season together again next year. What injustice in the world have you been avoiding? In these final days of Lent, take time to research the issue and get involved/make a donation to an organization working on addressing the cause you care about. O God, set our hearts and minds on a true revolution of values in our nation that will cause us to question the fairness and justice of many of our past and present policies. On the one hand we are called to play the good Samaritan on life’s roadside; but that will be only an initial act. One day, with your Divine Guidance, we must come to see that the whole Jericho road must be transformed so that men and women will not be constantly beaten and robbed as they make their journey on life’s highway. We know your heart, O God, is one of true compassion, and true compassion is more than flinging a coin to a beggar; it is not haphazard and superficial. You call us to see that an edifice which produces beggars needs restructuring. A true revolution of values will soon look uneasily on the glaring contrast of poverty and wealth. Amen.